Cut the lady finger in small round pieces. Marinate with little Chilly powder and salt. Deep fry ladyfinger /okra in oil till crisp. Grind grated coconut, green chilies and mustard into a thick paste and keep it aside. Take oil in pan and over high flame season mustard, red chilli and curry leaves. Switch off stove and wait for the seasoning to cool little bit. 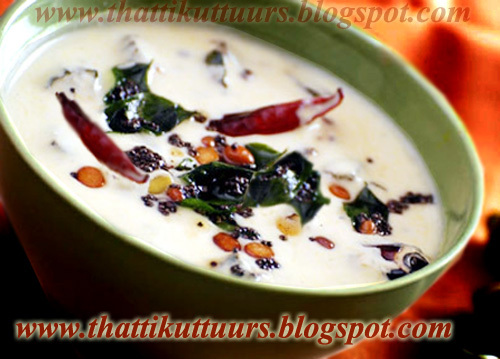 Add yogurt/curd and the ground ingredients and let it simmer for few minutes stirring continuously.